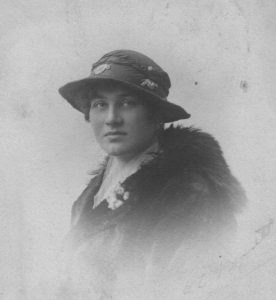 9th November 1918: Adela is now settled into her new job at India House and discovering the limitations of her French. She is finding it all a challenge, especially the silence, but her sense of humour wins through. Today she has moved into a boarding house in Howitt Road, just behind the Grove. This necessitates the purchase of a torch for the perilous journey across the Grove’s extensive back garden at night time. Adela’s new digs are comfortable enough – complete with gas fire [a luxury then]. The Pater makes a daring remark when Edgar’s parcel from France is opened!! … No wonder I didn’t get your letters when you address them to “Broadgate” Surrey! Before I forget Joe [Agius] told me to ask you if you knew what a night jay was, or some such word. It amuses me very much that Gilbert telling you, Winifrede is going to take over Broadgate. He means Adela is allowing her to live there & use all her stuff for nothing!! The only thing he is going to do is pay Bowden’s [the gardener] wages, which is a very small thing, considering everything. I’m going home at midday today to move. Must stop now, somebody is coming. Will write tonight. … I have just arrived at my new abode, it feels very funny at first. You know how everybody stares at a new comer! How I hate that above anything else. You are a darling to send me those stocking & garters. I’m awfully bucked with them. I’ve got a gas fire in my room and two beds, but I’m moving out of this room soon to a single one, but I have a gas fire in the other one to. So I can see a bit of cooking going on sometimes. I think I shall be very comfy here. This morning, Edgar, they made me go into Canada House next door & see a French man & he couldn’t speak English. So you can imagine what happened. In the end I drew it. He roared with laughter & I went very red. I do regret saying I knew French . Then I entered a couple of lorries instead of nuts!! I can see myself getting thoroughly disliked in a few days. I must say the two men in my room are awfully nice & the girl. They keep telling me not to make so much noise. If I don’t, nobody speaks & it really kills me. But what is more terrible still when a Belgian telephones to me. Its all up then. Then they come dashing down, & I swear it wasn’t me that answered – then they dash out again. And when I go to anybody’s office in the building, it takes me all the morning to find my way back. Its really rather fun, only you never know when old Shudd [the boss] is coming in the room & looks like a thunder storm. The torch is all right now. We didn’t take the paper off – idiots!! And I came through the garden alone and in the dark!! Think of it. I can’t get over it at all. Daisy has been playing tennis this afternoon. I’m just going to [?] & then go over the way. Goodbye darling and thank you again for the parcel. I showed the garters to Pater & he said they were spoilt because he couldn’t see them on! !